"Do everything that is necessary and absolutely nothing that is not." 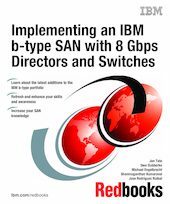 This IBM® Redbooks® publication, written at a Data Center Fabric Manager v10.1.4 and Fabric Operating System v6.4 level, consolidates critical information while also covering procedures and tasks that you are likely to encounter on a daily basis when implementing an IBM b-type SAN. The products that we describe in this book have more functionality than we can possibly cover in a single book. A storage area network (SAN) is a powerful infrastructure for consolidation, distance solutions, and data sharing. The quality applications that the IBM SAN portfolio provides can help you take full advantage of the benefits of the SAN. In this book, we cover the latest additions to the IBM b-type SAN family and show how you can implement them in an open systems environment. In particular, we focus on the Fibre Channel Protocol (FCP) environment. We address the key concepts that these products bring to the market and, in each case, we provide an overview of the functions that are essential to building a robust SAN environment.